Bitcoin Slips Below $3,500; Is $3,300 The Bottom Or Is $1,500 Still Possible? 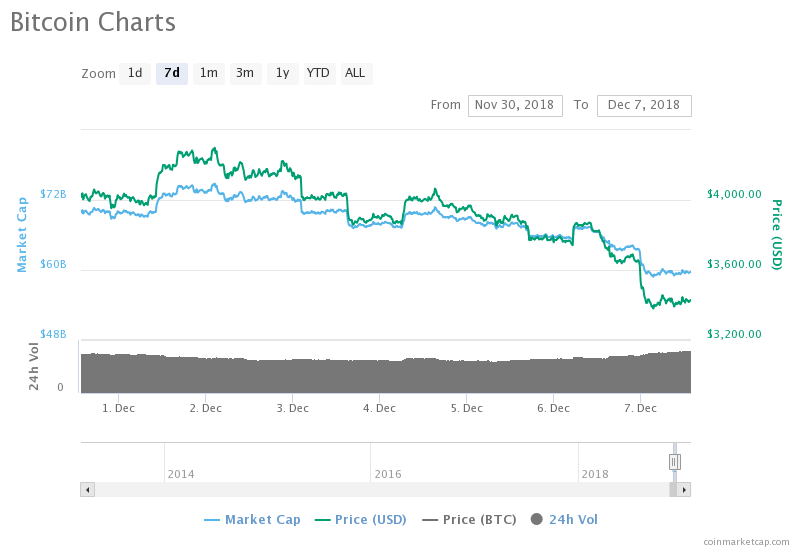 The month of December started out better than November but it is now turning out to be every bit a cryptocurrencies holder’s worst nightmare as November. Today, major coins have taken a dramatic drop with most coins losing 10% to 20% of their value. Bitcoin, the crypto leader, has dropped by 11% at the time of writing this and is now trading below $3,500. Should we expect $3,000? Given the markets latest trend, there’s no reason why we shouldn’t expect bitcoin to hit $3,000. In the last three weeks, coins have seemed to bottom out but have surprisingly dropped even further. Bitcoin which seemed to have bottomed out at $3,500, in the last couple of hours crossed that line and now seems to have bottomed at $3,300. Altcoins have also taken a major beating with Ethereum dropping below $90, XRP hitting $0.30 and Litecoin sliding to $26. In the last 24 hours, Ethereum has taken the largest hit among the top coins, dropping by 15%. The market still looks fairly bearish and we could see even further drops in the coming hours. Earlier this week, it looked like the market had taken steps in the right direction with coins soaring. Bitcoin was well above $4,000 and altcoins were also back in winning ways. Like every other positive reversal from the last three weeks, this was another case scenario of “one step forward, two steps back”. Bearish experts have predicted that bitcoin will bottom out at $3,000 before we can see a price reversal that pushes prices high. According to Bloomberg analyst Mike McGlone, bitcoin could be headed for $1,500 before the end of 2018. Following this latest price drop, there is growing pressure for holders to sell-off and cut their losses. For the more bullish holders, they are taking this opportunity to grow their portfolio and position themselves in anticipation of a price rally. The year 2018 has been largely bearish with coins across the market losing 50% to 90% value from their all-time high. While some have remained optimistic all throughout and called for a high end of the year, it seems most coins will end the year on a year low. The year 2018 has truly been a year of losses and all that the crypto community can hope for is a better year in 2019. As for now, the community can only wait and see if the bulls can quickly consolidate and hit back.